When I was little my family spent summer vacations at Ocean Isle Beach, NC. 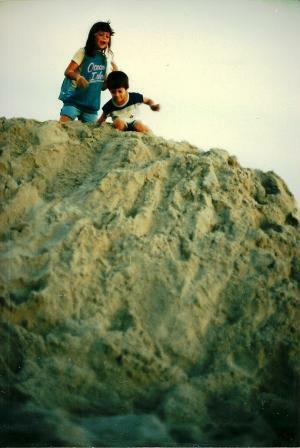 This is me with my brother Taylor, on top of a sand dune, circa mid 1980s. Note the 80s style mesh turquoise Ocean Isle swimsuit coverup I'm modeling. Rad, huh? So when I found out that the Ocean Isle Inn has a featured blogger program, I knew I would absolutely love to show my own family this gem of a beach. I can't tell you how excited I am that they picked me as their featured blogger for April. Ocean Isle is a quiet and pristine beach that is family friendly. It's a slower lifestyle, unrushed, with walks on the shore and ice cream cones and sunsets. It is not highly developed or commercial, and I love that. I can't tell you how impressed I was that I ran 4 miles and didn't see a single piece of trash. I think the Ocean Isle Inn fits in perfectly with the Ocean Isle lifestyle. 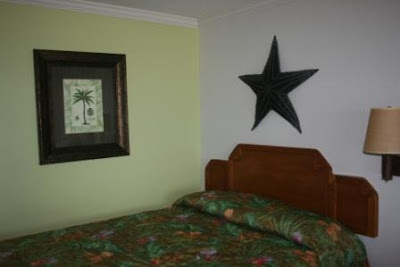 The rooms are quaint, comfortable, and cute with their festive beach themes. The rooms are also really clean. I know it doesn't seem like something I should have to write, but I used to be a college recruiter and I spent over 3 months of each year (for 6 years) staying in hotel rooms. Clean is important! Of course, 5 seconds after we descended the room wasn't quite so neat. 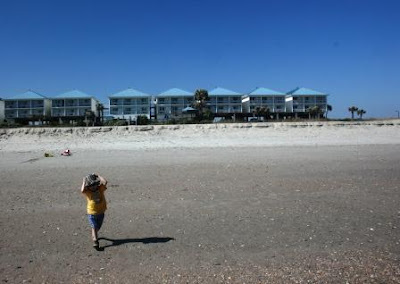 My favorite part of the Ocean Isle Inn is that it is directly on the beach. With my intense love of the ocean, it just doesn't get any better. We had our own little balcony, and all 3 boys loved being able to go out and watch the waves. Just a walk right out the door, and you are on the beach. That's the inn in the background. Pierce's dump truck got a little crazy! A free continental breakfast is included. 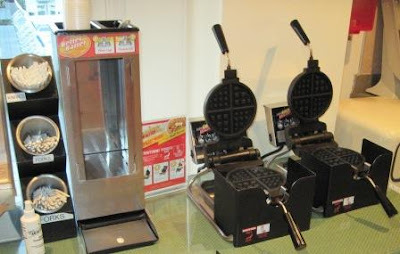 They have a waffle bar which the boys adored, along with options of oatmeal, cereal, muffins, bagels, yogurt, toast, and fruit. Breakfast was so relaxed - you can tell the vacationers who pass through are just enjoying the simple life. Everyone is full of smiles and so laid back. To the nice lady who got shot in the eye by Reid who flung a fruit loop - my utmost apologies. 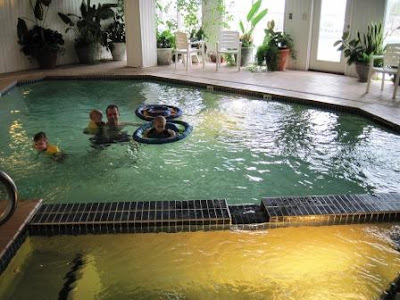 My boys also really enjoyed the indoor pool. Course I liked the hot tub myself. We thought the water was a little too chilly to swim outside, but here's a view from the indoor pool looking to the outdoor pool. There's a nice gazebo outside to the left. Incidentally, some guy from New Jersey was out there swimming. He claimed that compared to New Jersey it was really warm. Guess it all just depends on your perspective! Aside from all the wonderful things you'll enjoy if you visit, the Ocean Isle Inn has a philanthropic outlook towards the Ocean Isle beach community, which I love. They raise money for Habitat for Humanity and support the Susan G. Komen foundation. And I love that they take action to support endangered sea turtles. 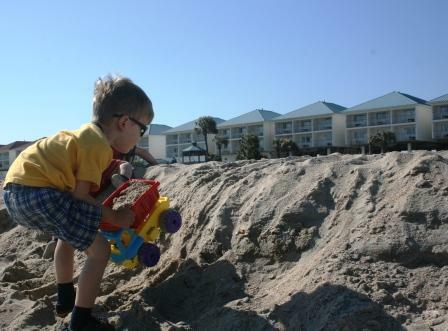 See, Ocean Isle Inn is in the heart of the sea turtle nesting and preservation area. So they chose the Preservation Line of shampoos and soaps. The Preservation Line logo, a sea turtle, is representative of the fact that a portion of the proceeds goes to help the Karen Beasley Sea Turtle Rescue and Rehabilitation Center save the sea turtles. On top of all that, the soap totally smells good too! 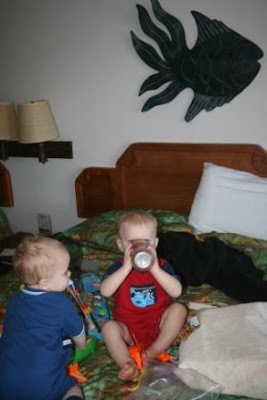 Bottom line - if you're looking for a fun, relaxing place to vacation with your family on the shore, Ocean Isle Inn will exceed your expectations. We had such an amazing trip, and we'd return anytime! 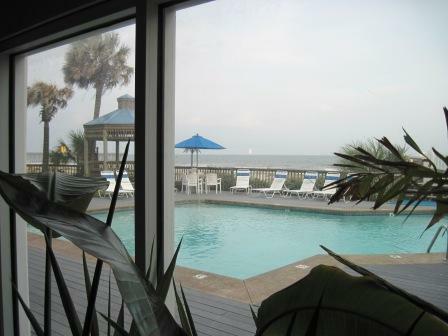 Disclaimer: As part of the featured blogger program, I received 3 nights at the Ocean Isle Inn. The opinions expressed above are all my own. This looks beautiful! I would love to go somewhere like that. Congratulations on getting chosen!! I stayed there for the NC Conference and I know exactly what you're talking about when you say clean. The rooms are immaculate! I loved being able to hear the ocean waves from my room too, and what a view! How nice!! Looks like you had a great stay and I am sure the boys had a great time!! Beautiful pictures! We are hoping to go to NC this summer and now I really can't wait!! Beautiful review! I hope to get there one of these days. It looks so pretty and relaxing! I'm glad you enjoyed. Sorry we never got to connect yesterday, but I waved to you as you drove through. Kinda' ;)! Wow, this looks awesome! Congradulations for being the one chosen, you deserve it. You are a very good writer, and basically you could sell snow to an eskimo!!! The cabins look really sweet, and right ON the beach, too!! I would have never thought by looking at them from the outside that they have an indoor and outdoor pool!!! I love the pool pictures. And the waffle bar, yum!!! The perfect place to chill!! and it sounds like a really fun trip -- can't wait to go to the ocean with the girls. What a fantastic place! I'm so glad you are all having a great time! I'm laughing because your "immaculate" room disappeared with the arrival of little boys. This looks like a great place to go for a family beach experience. LOL at the stray fruit loop story. Sounds like you guys had a wonderful stay. What a beautiful hotel...I love that it's directly on the beach!!!!!! Looks like a marvelous place to go-and I even spied palm trees! How cool that these sorts of programs even exist!!!! wow... what fun! You sold me - I'd love to come and see it sometime. No garbage on the ground for four miles. Awesome. Oh yay! Glad you got to go! Love Ocean Isle! What an awesome post and cool pics! I wish I would have been in town to meet you while you were here. But I'm sure the staff at Ocean Isle Inn made you feel welcome in our area! :) Glad you had a great time! Please send me your mailing info so I can get that out to you. It was our pleasure to have you with us as a Featured Blogger. 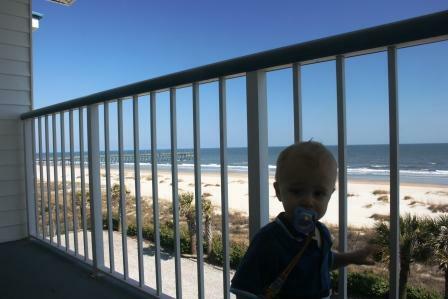 I'm so glad that you and your family enjoyed your time with us at Ocean Isle Beach. We'd love to have you visit with us the next time you're in the Ocean Isle Beach area. I'll have to do some research to see where this is! How cool is that?! It looks like a place I would love. Unfortunately, I'm on the opposite coast, but if I get over there... it's just the kind of place I look for. How awesome that you got 3 nights free & even more awesome that you had such a great time! we might need to check it out this summer!!! It looks like perfection. Now I'm even MORE anxious--we're going to the Outer Banks for our family vacation this year--at the end of June! Oh It looks like a place where I would LOVE to stay! Wonderful review!